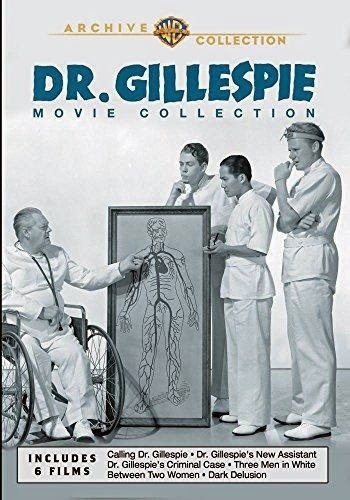 DR. GILLESPIE'S NEW ASSISTANT (1942) is an engaging film in the six-movie Dr. Gillespie Movie Collection. The set is available from the Warner Archive. 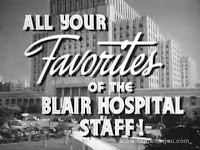 DR. GILLESPIE'S NEW ASSISTANT is the second of the films made after Dr. Kildare, played by Lew Ayres, left the long-running series. 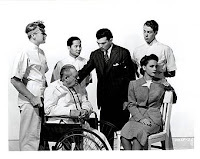 Dr. Gillespie (Lionel Barrymore) "auditions" three new interns to be his assistant: Dr. Randall "Red" Adams (Van Johnson), Dr. Dennis Lindsey (Richard Quine), and Dr. Lee Wong How (Keye Luke), aka "Brooklyn." 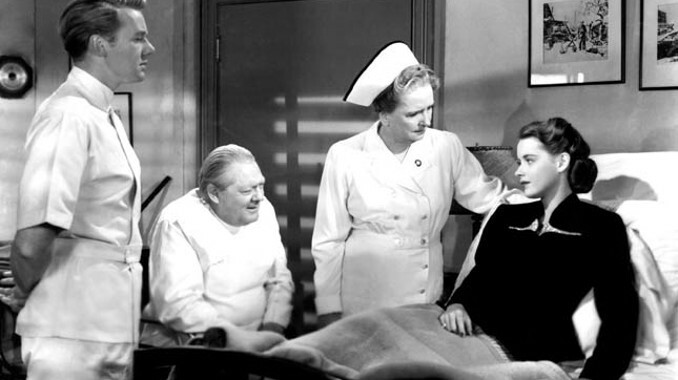 Simultaneously Dr. Gillespie is assisting the son (Stephen McNally, then billed as Horace) of an old friend whose bride (Susan Peters) claims to have amnesia after the wedding ceremony. This is an action-packed entry with a great cast. Some of the concepts, including not telling a patient important medical information, are outdated or even bizarre, but it must be admitted that such moments add to the entertainment value. A line about wife-beating is sure to raise eyebrows, and I was also baffled by the assertion that adopted children are loved more than natural-born children. This was one of Van Johnson's earliest films, with his pleasant boy-next-door personality shining through amidst the huge cast. 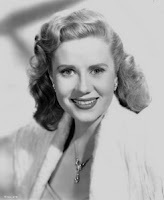 While continuing to make three more films in the Dr. Gillespie series from 1943 to 1945, Johnson also made his mark in a string of great films such as THE HUMAN COMEDY (1943), A GUY NAMED JOE (1943), TWO GIRLS AND A SAILOR (1944), THE WHITE CLIFFS OF DOVER (1944), THIRTY SECONDS OVER TOKYO (1944), and WEEK-END AT THE WALDORF (1945), cementing Johnson as a first-rank star. Keye Luke is entertaining as the bright and funny Dr. Lee Wong How, a role he'd play for the rest of the series. When someone assumes he might know a saying by Confucius since he's Chinese, he lightly replies that Confucius wasn't taught at his public school in Brooklyn. Alone among the interns, he also has the nerve to jokingly tell gruff Dr. Gillespie "You can't fire me, I'm terrific!" In its quiet way the Kildare/Gillespie series helped "push the envelope" in terms of more inclusive casting of professionals than was often the norm for the era; another example is in DR. KILDARE GOES HOME (1940) when a surgeon revered by Dr. Gillespie proves to be black. Today, of course, that would be quite unremarkable, but in 1940 movies, not so much. Michigan-born Richard Quine, who later became a director, plays Aussie intern Dr. Dennis Lindsey. It was his only appearance in the series. A real Australian-born actress, Ann Richards, plays an Aussie nurse Dr. Lindsey is thrilled to meet. The following year Quine married the film's guest starring leading lady, Susan Peters. Stephen McNally, who plays the beleaguered bridegroom, was a Fordham Law School graduate and former attorney who acted under his real name, Horace McNally, from 1942 to 1946. After leaving MGM McNally switched to the name Stephen, which he used for the rest of his acting career. The star of many Western and film noir titles, McNally's last screen appearance was in 1980, and he passed on in 1994. McNally was married for over 50 years and had eight children. The hotel operator in a few scenes is played by lovely Jacqueline White, best known for the noir classic THE NARROW MARGIN (1952) a decade later. White also starred in BANJO (1947), a Warner Archive release reviewed here a month ago. Other White films reviewed here in the past are MYSTERY IN MEXICO (1948), RETURN OF THE BAD MEN (1948), and RIDERS OF THE RANGE (1950), all of which are likewise available from the Warner Archive. A young woman beaten by her drunken husband (Paul Fix) is played by the late Dorothy Morris, a charming MGM ingenue of the era. Morris, like Van Johnson, would later appear THE HUMAN COMEDY. Wonderful character actors such as Dorothy Adams and Arthur Shields also put in appearances. 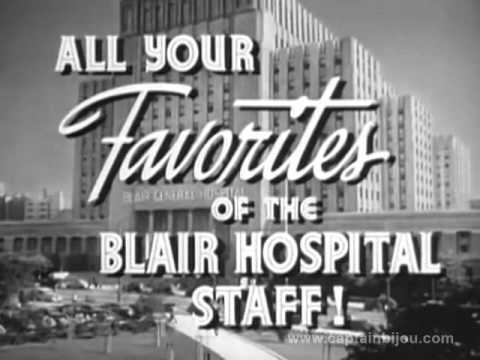 Series regulars who appear in this entry include Alma Kruger, Walter Kingsford, Nell Craig, Marie Blake, Nat Pendleton, George Reed, Frank Orth, and Eddie Acuff. This was the first film in the series directed by Willis Goldbeck, who had been writing screenplays for the series dating back to the very first film, YOUNG DR. KILDARE (1938). Goldbeck would direct the series for the rest of its run. 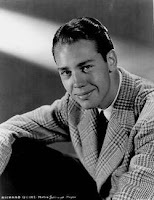 Harold S. Bucquet, who had directed all but one of the previous Kildare/Gillespie films, retired from the series after CALLING DR. GILLESPIE (1942). Bucquet made just a few more movies and passed away in 1946. 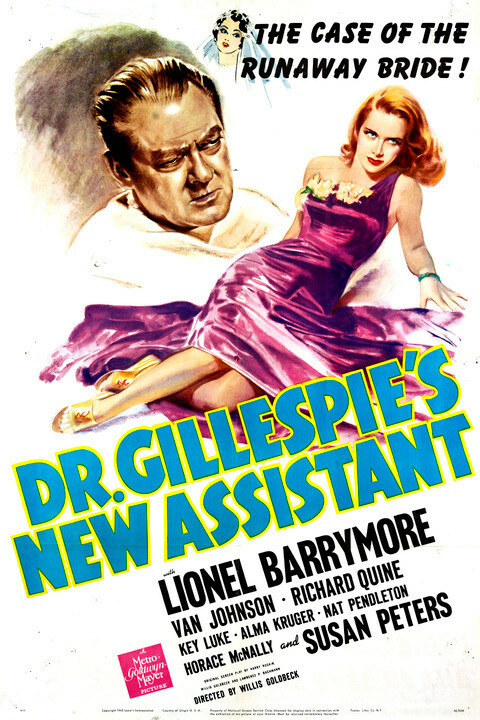 DR. GILLESPIE'S NEW ASSISTANT was filmed in black and white by George Folsey. It runs 86 minutes. DR. GILLESPIE'S NEW ASSISTANT is a terrific DVD print. The trailer is included as an extra. Thanks to the Warner Archive for providing a review copy of this DVD collection. Warner Archive releases are MOD (manufactured on demand) and may be ordered from the Warner Archive Collection at the WB Shop. Please note that the initial sets of this series sold by the WB Shop will be traditionally replicated (pressed) rather than burned on demand.